« Anyone driving up from Albany to Perth this week, WA? Another sign the manmade house of CO2 trading is coming down? Looks like the market is more realistic then the UN’s hot air Xmas wish. When voluntary CO2 prices in the US dropped to $0.25 per ton, the Algore/Sandor Chicago Climate Exchange (CCX) quitely folded up the tents on its CO2 trading arm and crept away. But I imagine the greenies will find a way to rescue the European market before that happens, if they have any money left……. Well, it’s wrong anyway. during the first phase of the EU ETS over-allocation cased it to drop to $0.00. Can’t wait for it to fold like the Chicago Climate Exchange. I am telling you people that this carbon trading stuff is simply a racket and it will have absolutely no measurable impact whatsoever on carbon emissions globally. The difference in Australias CO2 reductions can be swamped by a single volcanic eruption someplace. The Carbon Tax aims to reduce Australia’s CO2 output by 160 million tonnes. World CO2 emissions in 2008 were 29,888,121 million tonnes. So that makes Australia’s CO2 reduction 0.00053533% . So don’t they see the point here? We do not have instruments sensitive enough to even measure the difference on a global scale. The largest emitters on the planet are not even part of Kyoto and are exempt from emissions restrictions. In fact, the largest growing emitters would collect PAYMENTS under Kyoto2! Taken collectively, the aggregate reductions of ALL countries under Kyoto would not be noticed if they all met their targets. But even that is beside the point. With every passing year there are more data that invalidate and discredit the notion that CO2 is having any major impact on global climate. There have been at least three 30-year periods of warming in the instrument records; a late 19th century rise, an early 20th century rise, and a late 20th century rise. All three of those periods were right around the same duration and with nearly an identical rate of temperature rise. Since 2004 ocean heat content in the top 700 meters of the sea has stopped increasing. Sea level rise has flattened out (most of 2011 was below the highest reached in 2004), surface temperatures flattened out in 1998 and have been falling since 2005. In order for there to be greenhouse warming, the atmosphere MUST heat and re-radiate this heat back to the surface. The AQUA satellite measurements for 14,000 feet (Channel 5) currently show the coldest temperatures ever recorded since measurements began in 1979. But as they say in tax heaven: every little bit counts. $ that is, the rest does not matter anyway. This is great though ins’t it. Quebec can now become the poster child for cap and trade, clean air etc. They will reduce their emissions hugely and will show the world what is all possible. Of course what they will not say is that to achieve the wished for reductions all coal generated power will now be brought in from Ontario. Ontario will also be happy, more jobs created to generate all that power for Quebec. Provincial revenue goes up. Every one wins except the poor guys losing their jobs in Quebec, but hey who cares, it is good for the environment eh. Doesn’t Quebec produce enough energy with hyro to export some? Doesn’t this mean they actually earn carbon credits for doing what they were going to do anyway? Isn’t California’s loss Quebec’s gain? Just Askin’. quite right. They export a lot of hydro power. Those industries that are using the half a million ton of coal they use/import may have to find another home. Considering that this relates to Quebec province, and I presume to Montreal, this is hilarious. In July 2009 I had a visit to Montreal (I love the place, really, I do love the place), and I found it to be cold. It was windy and rainy during our brief stay. This was in contrast to the conditions in Hartford CT which were quite hot and humid, and also in contrast to conditions at Jasper, Banff and Lake Louise, where it was close to 100F. What irked me about Jasper was the fact that the very plush hotel establishment failed to prove air conditioners to its guests because apparently they are forbidden in the national park… really? With all of those trees? back to Tallbloke a second. how’s this for smearing? If they want information they send 6 armed police to break the door in. Someone is scared, but it ain’t us. How do we know the other degrees weren’t issued in error too? We don’t, however based on his writing had he claimed to possess one in literature it would be fairly obvious that one was in error. Some of these bloggers need to remember to insert the qualifier “piss poor” in front of their claim of being a writer. After Tallbloke finishes with Laden, Harvard should sue him for bringing their degrees into disrepute. Greg Laden exhibits breathtaking stupidity. You know as a youngster(I am 49) i always thought it funny when the adults were saying that before you know it the goverment will tax the very air we breath. Now it is not funny, down right disgusting that the poloticians are getting away with it, here in the USA, and abroad. I hope they realize one day soon what they have done. Hopefully the day after they are voted out of office. My self, for the last couple of election cycles i do not vote for any incumbent. Polotics should NOT be a career. To many of them are ruining this globe with thier nonsense. They aren’t so much taxing our air, they are allowing small countries to charge us rent for it. That is basically what it boils down to. Smaller countries get to charge larger countries rent for the atmosphere in order to provide a mechanism for the international socialist goal of global redistribution of wealth. It is about money, it isn’t about CO2. CO2 is simply the mechanism by which they scare us into giving up the money! If CO2 were all that much of a threat, they would be absolutely INSISTING that everyone reduce their emissions, not simply select countries. They would also be encouraging the immediate switching to nuclear power which is technology that is currently available that could eliminate every single coal power plant in the industrialized world right now. But they aren’t. They tell us that if we don’t act RIGHT NOW to reduce CO2 emissions by amounts so small that they can’t even be measured and hand over hundreds of billions of dollars to third world despots, we will boil like frogs in a pot. But no, we must not build nuclear. We must spend the money on new technology that just happen to be driven by companies having major political connections with the left. They want us to install generating capacity that can be wiped out in a tropical storm or even a hailstorm. Could you imagine if Huntsville, Alabama in the US had a major portion of its generating capacity in wind and solar when those storms went through this spring? Same with Joplin, Missouri. They would have had to replace not only the distribution grid, but also the generating capacity as well. They want us to install a power generation system that will be completely wiped out by bad weather every 10 years or so. The entire thing is so nonsensical when you really look at it, it makes you wonder how anyone could fall for it. It is only when you follow the money that you see how that could happen. If I were in the windmill business, I would LOVE for Miami to install a bunch of windmills. Remember Hurricane Andrew in Homestead, Florida? It would wipe out every single turbine. There would be no repairing them. They would all have to be replaced. Do you think insurance companies are going to go for that after about the 25th time they have to replace someone’s solar panels due to hail? In Texas and Oklahoma they regularly get hail the size of ping pong balls. Hail the size of baseballs is not unheard of in most years. Softball size hail even happens about once a decade. Insurance companys would drop the people with the wind turbines and solae panels pretty quick as they have been known to do, the liability for damage if one of those 300 foot tall turbines were to be flung to the winds by a tornado is huge. Desperation will drive the alarmists to yet more extreme actions and many will suffer, I suspect. Desperation will drive these alarmists to yet more extreme actions, I fear. Their desperation is making their demands more rediculous, even now. Witness the outcome of Durban where they are demanding an end to wars, a world court to administer “justice” on developed countries and a world economy ruled by the UN. True colours are showing. Politicians shy away from extremism. The UN IPCC, WWF and Greenpeace are just a notch short of alienating every sane politician who expressed some association with their cause. I thought that is exactly what the Catholic church has been trying to impose on the world since year dot..only to be over run by zealots of a different type…Muslims and GW alarmists. This is the situation that has led to the potential meltdown in Europe. Some major EU countries want to use the German work ethic and financial conservatism to backup up their laise faire lifestyle and spending patterns. 6.3 Euro! At this rate, carbon won’t be worth anything at all by mid next year in any other country besides Australia and NZ. That’s assuming there’s even a Euro left to buy the stuff. In California, every corporate business that has the flexibility is moving out of state. The tech and movie companies are staying, but they don’t produce much CO2 and can afford to be critical of every other business group. Way to go Labor and Green parties! But then, the ETS was never really about lowering CO2 emissions was it? Malcom Miller, your fears have already materialised. In the UK, the police have raided Tallbloke’s home and seized his computers in the hope of finding the climategate whistleblower. I’m not sure they have the legal clout to actually do this, surely Tallbloke would have to be under suspicion of some crime and a Court Order would have to be associated with the seizure. I’m no solicitor though but this kind of activity is very suspicious and downright immoral. Hehe free market? Does a free market has set prices? Flee markets maybe but not the free market. Financial power houses only creates new markets if they’re unregulated markets, apparently, it is only then, for early adopters, you have the highest probaility of making loads of free profit. As we have a free market, can I buy Carbon Credits in Europe for $8 and sell them here for $23? Great idea, wish i had thought of it, i believe that should be doable. If it is i see a retirement nest egg in the making. Nice thought, but sorry Michael. The Australian legislation values any credits purchased outside of Australia at a (significantly) lower value than ‘home’ credits. So that $8 credit (6.3 Euro) would be valued at around $5, so you would need more than 4 of these Euro Credits to make one Australian Credit. Have you a reference for that differential in value? Whelan, you got the eye of a global commodities arbitrageur! So much for the lie about carbon credits being a free global market. Will the EU contest Australia’s 400% carbon tariff as illegal trade barrier through the WTO? Doubt it. Wes, your idea of illegal trade barrier might be worth looking into, after all Bob Hawke was after a level playing field, is this still Labor policy? that is, presuming the level playing field was for both sides..
Oz has had about the only level playing field in the world for about the last 25 years, it’s only our pollies and economists who are too stupid to see this. You’r not telling me Bob lied to us? he wouldn’t do that, he is one of us, the working class. Nice one Michael … it’s called ‘arbitrage profits’ …. ….. on healthy turnover of around 15 million units. Note specifically how the ‘entity’ who wrote the article says that 15 million units is healthy. Those 15 million units amount to the equivalent of 15 million tons of CO2 emissions. This is almost the total CO2 emitted by ONE large scale coal fired power plant over one whole year. For an equivalence in Australia, just Bayswater Power Station alone emits that same 15 million tons of CO2 in just 36 weeks. So, 15 million tons for the whole of Europe amounts to the tiniest percentage of those CO2 emissions. Does the Euro market have a ‘price floor’ like the Australian market is supposed to? It will be interesting to see how the Australians think they can control the market price floor when this inevitably happens here. Going on your Bayswater example – I see that Macquarie generation (owner of Bayswater) reports over $1 billion in revenue for the year. So, let’s assume they need to purchase 30 million tons of Co2 permits (for both Liddell and Bayswater) – that makes the cost about – say $240 million dollars to offset their emissions at this low, low price. Still 1/4 of their total revenue. Anyone still think that a couple of bucks a week in ‘carbon tax refunds’ is going to offset this price increase? Seeing as the big generators are owned by the QLD and NSW state governments, will the advertised price increases be attributed to the carbon tax, or will the ACCC try and fine them? Macquarie Generation’s total amount to be paid is actually $540 Million. OK – even better for purposes of discussion. Is that at the current EU price or at the Aus carbon tax price? Under the tradeable ETS segement (post 2015) an EU certificate is supposed to be interchangeable with an Australian certificate, yes? Or, to put it another way, a provider of carbon credits could choose to either sell it on the EU market or the Australian market. Even if not directly swappable, arbitrage between the two markets means that the higher price cannot last. Why would anyone accept $8/ton in the EU when you can sell in Australia and get $23. That means, of course, oversupply and eventual price collapse, despite any feeble attempts to pretend they can set a floor price. Of course, the price paid isn’t required to be submitted – just the certificate, unless I have that wrong. Anyway you look at it, total market failure is more likely than market success. If I were a young economics student, what a great study this would make, if you could find an academic environment remotely prepared to study the failure of their own ideas. Macquarie Generation costs are calculated at the $23 AUD mark. Our Government enshrined in the current Australian legislation that credits gained ‘outside of Australia’ are not the same value as ‘home’ credits, in fact a lesser value. So, you could purchase offshore credits at whatever their going price is, but at surrender time, those Credits need to be tallied so that they have an equal value to Australian credits, based on the original purchase price. That is, if the Oz credit is worth that $23 (year 0ne) then the non Australian credits have to be tallied so that their value adds up to that $23 AUD, so at this current price of $8 and devalued courtesy of the Oz legislation, you would need around 4 of them to make the same value as one Oz credit. I’m not sure about selling Oz credits offshore, but why when the cost her is $23, would anybody sell it offshore for the going rate there, if that is now barely $8. What needs to be kept in mind here is the Macquarie Generation is the largest provider of electrical power on Australia. If they will be finding it difficult, then all of them will be in the same boat. You will only need ONE large scale power provider to shut up shop, and there will, (literally) be anarchy in the streets, and that anarchy will not be Green groups celebrating the shutting of a large scale CO2 emitter. No large scale power provider, and power is either rationed or blacked out. That’s not just in the residential area. It’s hospitals, Industry, Commerce, the rail system, where people work. MaGen’s PROFIT is about $200 million PA; try that instead of revenue in your calculations. You have been taking the rational argument tablets again, haven’t you? I have told you about this before. You spoil all the fun for the rest of us! note specifically how those who write in the media about all this (as in the article Joanne has linked to) are totally clueless. Let’s do some sums for a minute, and this is just for the U.S. In the rolling 12 months so far, the U.S. has burned 960 million tons of coal to produce a tick over 43% of its consumed electrical power. (In Australia, 75% of our consumed power is from coal fired sources) That burned coal resulted in an emission of 2.75 Billion tons of CO2. In the rolling 12 months so far, the U.S. has burned 7.8 billion mcf of Natural Gas to produce a tick over 24% of its consumed power. (in Australia, around 15% of our consumed power is from Natural Gas sources) Each mcf (thousand cubic feet) of natural gas produces 122 Pounds of CO2, hence a total CO2 emission of 475 Million tons. So add together coal fired and Natural Gas for the US and there is a total CO2 emission of 3.25 Billion tons. They wanted to introduce their own ‘price on Carbon’ (The American Power Act, now thankfully not passing into legislation) of $25 per ton. This effectively means that the CO2 emissions, just from electrical power generation alone would have generated for the U.S. Government $US 82 Billion. Tell me a market that size would not have the propensity to be scammed. But I am interested in your figures: 43% from coal, 24% from natural gas, giving 67% of electricity coming from carbon sources. 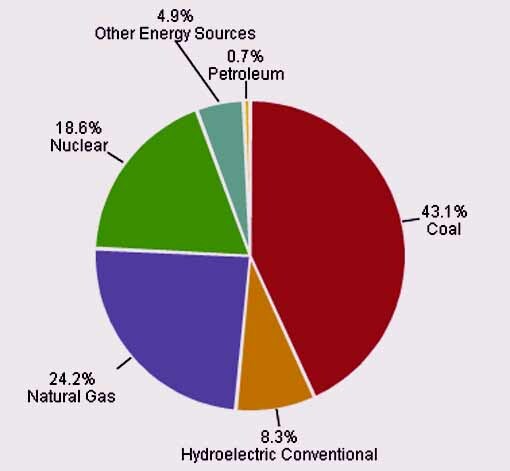 Assuming that the remaining 33% is from nuclear, hydro, wind, and solar, do you have a breakdown on the proportions? That breakdown is at this following link, an image of the most recent pie chart, for August 2011. Note how Nuclear Power makes up almost 19% of the total power consumed in the U.S. There is an anomaly here that not many people understand, especially the Media reporting on it, and Green Groups (read anti Nuclear) who want to highlight it. Those people say that Nuclear Power makes up barely 10% and some say even less of U.S. total power. What they are quoting is the Installed Nameplate Capacity, eg, the total ‘up front’ size of the plants in total. By far the most important thing here is not that Nameplate Capacity, but the actual power being generated for consumption, and that total comes in at just under that 20%. Only one Nuclear power plant has come on line since that incident in 1979. At that time, Installed Nameplate Capacity for Nuclear Power was around 15% of the total Nameplate Capacity, and power generated for consumption was around 12%. Now while the same number of Plants are still in operation, and with others going in, that Nameplate Capacity percentage has decreased, while at the same time, the Consumed power percentage has risen to where it sits today, almost 19%. The average Capacity Factor for ALL Nuclear plants in the U.S. is currently around 92% for the year, and for Summer, up around 95%. This is far and away the highest CF for any form of power generation, anywhere. When you add Coal, Natural Gas, Petroleum based generation, and Nuclear, the U.S. total comes in at 87%. Here in Australia, 93% of all consumed power is from CO2 emitting sources, Coal, Natural Gas, and petroleum based generation. Across the chart, you see ‘Other Sources’, and this takes in all renewables, however it is misleading, because the favoured renewables are Wind, just slightly over 2% and Solar Power, just slightly under 0.02% and no, that is not a misprint. Realistically I think (2) is more likely at this stage, given that the EU has rather larger problems to deal with right now. The two problems are linked. Market manipulation in an attempt to drive the value of the Euro upwards is the cause of the pending market collapse – and the situation is getting more serious by the hour. I hope it’s down to ONE CENT by the time we vote Tony in to unwind the abominable CO2 tax! Adam Corner profile (from link): Adam Corner is a research associate at the School of Psychology, Cardiff University, UK. His research interests include the communication of climate change. The survey’s authors suggest that the lingering effects of the 2009 Climategate affair – the release by climate sceptics of private emails between climate researchers at the University of East Anglia (UEA) – has knocked people’s trust in climate science. Something has gone wrong with global warming. It’s not that the world has stopped heating up. It’s that the anti-warming political movement, which seemed almost unstoppable when the Intergovernmental Panel on Climate Change won the 2007 Nobel Peace Prize, has stalled. The “Climategate” emails show scientists so passionate about their beliefs that they are unwilling to brook opposition. Fervor seems to have led to overconfidence. The status of the claim that recent years have been by far the warmest in a millennium has been downgraded from certain in 2001 to likely or mistaken (depending on the expert consulted). The activists’ excess of passion and certainly has led them to a dogmatic conviction that a radical policy — rapid and sharp reductions in carbon dioxide emissions — is required to save the world. Since industrial economies cannot yet function without using large amounts of energy generated by burning carbon, the anti-carbon prescription equates to a campaign against prosperity — tough on rich countries (too tough for Canada to bear) and practically a sentence of economic stagnation for poor ones. If climate change is to be taken seriously, the IPCC and UN conferences need to have less madness and more method. Alberta would by far be the most affected province of Canada, as it is the heart of the oil industry in Canada. Provinces like Quebec and B.C. have large hydro reserves and get most of their electrical power from hydro. Push the carbon reductions to far for alberta and it would probably break away from Canada. for a history lesson, especially the sections titled “Reaction in Western Canada” and “Impact in Western Canada”. No Federal government wants to be responsible for the break up of Canada. This article has a very sensible approach to the problem and the Alarmist’s need to take it into account and perhaps act but I doubt they will. They’re religion is to dogmatic and is unwilling to let it’s evangelist’s believe in any other doctrine. typical of NYT, the “ribbing” link at the end of this piece links to HuffPo (in case u don’t want to go there). if u do click on the link, u will face a top story: “‘Skeptics Of Global Warming Are A Well-Funded Cult’” Nice. Could the police be pursuing leads on several fronts, however? Meanwhile, the police have been taking some ribbing online from folks who feel they have not done enough to catch the culprits who distributed the hijacked e-mails. … I have begun drafting a memorandum for the prosecuting authorities, together with all evidence necessary to establish not only the existence of numerous specific instances of scientific or economic fraud in relation to the official “global warming” storyline but also the connections between these instances, and the overall scheme of deception that the individual artifices appear calculated to reinforce. In each instance, the perpetrators of the fraud will be named and their roles described. Once the report has been completed, it will be reviewed carefully by experienced criminal lawyers in each of the national jurisdictions in which the perpetrators reside. The report will then be submitted to the prosecuting authorities in each jurisdiction, with a complaint lodged by lawyers acting for citizens of that jurisdiction against perpetrators there. No complaints can be lodged against the IPCC or the UNFCCC, for they are beyond any national jurisdiction. However, individual “scientists” can be brought to book in the countries where they normally reside. Here is how you can help. If you consider any specific aspect of “global warming” science to contain an element of fraud as defined and illustrated here, then please – in strictest confidence – get in touch and let me have as much detail as possible. Be specific. Name names. Give details. If you can, supply or point me to backup evidence. Since the information you will be supplying to me is in contemplation of criminal proceedings, it is privileged and no libel suit would succeed even in the unlikely event that the perpetrators discovered you had contacted me. Your details will be kept confidential, and will not appear in the report or be passed to any authorities. Don’t be coy. It is all too easy to fall for the line now being ever-more-anxiously peddled by some of the more notorious fraudsters – that science cannot thrive in an atmosphere where scientists who publish honest research in good faith can find themselves having to answer charges in a criminal court. Sounds like the gloves are coming off. Is this the beginning of the end? That’s interesting. Galileo has collected a brief of evidence for future litigation. Was considering litigation earlier this year but decided to wait it out to catch more flies in the web. Slightly off this topic. Attended Ian Pilmer’s book launch last night. Something Ian said made mine and a few others’ ears prick up. Ian purposefully has a dig at people in his new book to encourage these people to take legal action against him. Intent…to get them in the witness box under oath. Ian’s book is now into its second print, got an autographed copy to send to my cousin who is a poster here so expect it in the mail in a week or two. Oscar Wilde learned that hard way that libel suits don’t always work out well. Norfolk Constabulary, which is leading the inquiry into the theft of thousands of emails from university computers, said nobody was arrested during Wednesday’s raid. The blogger – whose real name is Roger Tattersall – is a digital content manager at Leeds University. In an email to The Independent yesterday, he denied having anything to do with the hacking of emails from the Climatic Research Unit (CRU). “I am not the person who took the data and emails from the CRU,” he said. “I just happen to run a science blog which was the recipient of a comment containing a link to the second tranche of ‘Climategate’ emails. As they always say, follow the money. an expose on the ICE Trust. “The men share a common goal: to protect the interests of big banks in the vast market for derivatives, one of the most profitable — and controversial — fields in finance. They also share a common secret: The details of their meetings, even their identities, have been strictly confidential. They also had their fingers in the now defunct Carbon Climate Exchange. Many of the people involved are the same people who helped deliver the US (and the world) the sub prime disaster, and now they are off looking for new unregulated areas to trade and skim their fees. Enron would be proud of their efforts. They must wake every day laughing their heads off that finally, after all these years, they can finally trade ‘air’, and be paid handsomely for it. SO a voluntary opt-in monopoly money style system has a low price? What does that have to do with the price of carbon in Australia? Don’t be so voluntarily obtuse. It has everything to do with the price in Australia. These credits are tradeable on the international market. Essentially it means you can buy in the EU for 8 dollars and submit receipt to the Aus govt. This is already happening in NZ, so don’t pretend it can’t happen here. It means that the so-called ‘compensation’ money paid by the government is short term in nature and will dry up quickly. It means that carbon markets are a failure because all markets will eventually revert to their natual price – which in this case is a near-zero level. It means that fanciful concepts like ‘price floor’ are as imaginary as the entire concept that trading bits of paper will save the world from doom. I hope your constituents know you support this rubbish. YOu should read Tony’s post below as he explains that you cannot buy in EU for $8 and submit as a like for like credit. When a truly international carbon market exists, and the price is zero, it would be a great success as it means industry is transitioning without stress to a low carbon economy. The oddest part is that people to this day in the US (California is the latest example) are STILL on that bandwagon even though the companies it was designed to benefit are long bankrupt. It is likely that the failure of the US to ratify Kyoto is likely why Enron went bankrupt. Enron was going to make a killing with this carbon exchange scheme. I have to wonder who is making a killing on it in Australia. A manufacturing company of which I’m a director and is run by my sons got a notice from TRUenergy today. “I’m writing to tell you that your prices will increase from 1 January 2012. On checking the business and private rate increases per MJ are 10.5%. For usages over 550,000MJ the increase is 6.5% (which makes one wonder if the GW effect decreases as the GHG emissions increase). That’s a pretty hefty increase and the carbon tax hasn’t yet kicked in. This is where the rubber hits the road. The price of a tonne of CO2 is pretty much irrelevant to end users and more for those types who love speculating on the markets. However if the government stuffs up its carbon pricing we know who will pay for it in the end. It won’t be the few “big” polluters but millions of little polluters like you and me who together keep this country, including its lay about public servants going. Rather than reply in a Comment above, I thought I’d give this a separate Comment of its own. Let’s do an exercise then, shall we. As I mentioned above the scale of Credits is something people find a little difficult to comprehend. Let’s do the exercise for the Plant I try to use as a reference, Bayswater. As you can see, their total cost is around $540 Million. Let’s say they ‘want to do the right thing’ and altruistically use the Clean Development Mechanism to invest in developing Countries. For the purposes of credits, they are not looking for small amounts of credits, but lots in the hundreds of thousands, considering they have to hand back to the Government 23.5 Million Credits at surrender time. So, let’s say they are looking for half a million credits, valued at say the existing market of the EU, hence half a million credits at that current $AU8 mark there’s $4 Million. They do not get ownership of anything they sink that money into, because all they get are the Credits. Those Credits are not worth the same value as Australian Credits, and could be worth only $5 to $6 AUD, so at surrender time (with Credits based what they were worth at the time of purchase) that’s half a million credits at $5 or $2.5 Million, and if the Australian Credits are worth $23, then that amounts to an Australian Credit equivalence of not the half million credits they purchased, but only 109,000 credits, a devaluing by a factor of almost five. For an entity needing credits in amounts of those hundreds of thousands, then they would need to invest an awful lot of money to get realistic amounts of credits. Meanwhile, one UN subsidiary is sinking money into Developing Countries by at last bringing electrical power to a populace who do not have it. The World Bank is financing the construction, of, and wait for this, Coal fired power plants. So, realistically, Bayswater could sink its money into the construction of a coal fired power plant in a developing Country, while every obstacle would be placed in its way to do exactly the same thing here in Australia. Do not EVER try and tell me that this is about the Environment. It also implicitly tells us that the UN via its World Bank also does not believe that renewables, like wind and solar, have a chance of matching it with coal fired power when it comes to improving the lot of the energy poor. Pity we are stuck with a bunch of knuckle headed ex union officials in Canberra who are completely clueless on this issue and should not be in charge of making energy policy. Hope the Libs are taking notes and follow Canada out of Kyoto as a starting point for a return to an economically rational power generation policy. Governments and the UN should have no input regarding the share market. They are creating an insider trading scheme on a false commodity that keeps this planet alive! Their meme is to stop a fictional global warming by taxing Working Country`s IE (Western Country`s )and send the money to Country`s that are over populated and under educated . The results could be ? Lets just consider where the money goes. 3)The Money ends up in the hands of the Banksters. 4)The Money goes to the poor starving people. In my life time I have seen no Improvement in world poverty. This ones for you Tristan , If you intend to go into Politics , Prepare to sell your soul . What a masterful understatement. It should be immortalized in history books everywhere. As the resident realist on power production, I would like to pose a question to you. For quite some time we have been watching the EU at crisis talks with all the yelling & screaming & finger pointing. To me, as an unsophisticated observer, it is pretty clear that Angela Merkel & Nicholas Sarkozy are playing the roles of the heavies by having the biggest economies & holding the purse strings. Germany on the other hand has long been a technological manufacturing & industrial powerhouse. However as Angela Merkel moves to retire a large chunk of her nuclear power stations & (as I believe) the majority of her thermal power stations are/were fed with derdy brown coal, it begs the question: what is going to power the production lines at Mercedes? I don’t think their supply from EcoBling will cut it. Perhaps Germany’s economy may yet be subsidised by money wired home from German guest workers on the production line at Tata in India. Has the EU got a chance? Perhaps Vlad P may be persuaded to pump them over a bit more gas. At the moment he does not seem to have as much difficulty with fractious greenies. AS I understand it, the huge ‘manufacturing engine’ that is Auto construction in Germany either has already, or is in the process, of moving, lock stock and barrel to China. In the lead up to the Olympic Games in Beijing in 2008, the ABC ran a relatively obscure doco, hidden away late one night midweek, and never repeated, hence not many viewers, considering the interest factor would have been fairly low. That doco was ‘The Cars That Ate China’. It was absolutely outstanding for the insight it offered. I constructed a Post for my site on that Doco. They featured interviews from every aspect of the auto industry, from Car ownership, car sales, the manufacturing, the workers, the roads system, the subsidiary industries cropping up. As I watched, my jaw just dropped with each new aspect shown. All auto manufacturers are moving to China, if they’re not there already. Benz especially have a monster state of the art plant there, and I mean huge, almost 500 acres, for Mercedes Benz Daimler Chrysler. On that land are 2 huge plants, one for the Benzes and the second for Chryslers and Mitsubishi SUV’s. They roll out around 25,000 E and C Class Benzes each year from the Benz production line. They roll out 80,000 Chryslers and Mitsubishis each year from the other plant. The workers are paid around $8 a day, and consider themselves to be fabulously well paid. Jobs are coveted and held onto with passion, and the workers are immensely proud of what they do. So, if they can make a Benz in China for a fraction of what they can make it for in Germany, you tell me why an Auto CEO would not move to China. That Benz sells for, well, whatever a Benz goes for in the Western World, because the Benz target is not really China. The Chinese are falling all over themselves to attract manufacturing like this to China, and in fact, manufacturing is flocking there. It’s not just German auto manufacturers. They’re all going there. Along with all other EU manufacturing as well. I doubt that car manufacturing in Germany is about to close anytime soon. Most of the big German car companies (BMW, Mercedes, VW) have significant state-level ownership which keeps them in-state, as it were. I would guess that much of the output in China is for Asia itself – you say that this output isn’t for the Chinese but the simple fact is that even Ferrari moves large numbers of vehicles in China nowadays. German car companies are profitable simply by being better engineers than all the others. Even Australian delivered VWs are built in Germany rather than in South Africa where they used to be, simply because they can operate the German plants at low enough cost despite the high wages. It’s all about productivity in the end. Having said that, there’s no doubt that more manufacturers will move to China and China is already moving into the low end of the market just as the Koreans did, and the Japanese before them. But the main point I wanted to pick up was that the myth of EU ‘carbon reductions’ is just offshoring of the manufacture. So as manufacturing – of all kinds – moves out of Europe, the ‘EU’ emissions output falls (or, it should be said, grows less strongly) – but those factories just pop up in China. Global emissions are the same – all things being equal – but in realiy they are probably worse because of dirtier power sources and more shipping involved (ie, goods shipped halfway round the globe instead of being delivered in Europe via goods trains. The entire thing is a thimble-and-pea joke but still we have conceited idiots telling us how it is all going to work out beautifully. Large corporations in Europe are calling on Brussels to prop up the price of carbon credits. The loss of money on paper must be getting enormous and where do these corporations find buyers in a dying market? It’s looking more and more like a complete write-off of investments. What does this imply for Australia? The carbon tax is not just a tax. The way the Labor and Green parties have set it up, it’s a currency; guaranteed by the Australian taxpayer with a minimum price. A currency that will be traded on a national basis but will be utterly worthless elsewhere. If this is the case and with the EU market tanking, the Aussie carbon credit can only go one way and that is down. How does this pan out for corporations and businesses that have had no choice but to “invest” in the currency with a government-backed guarantee? I made mention some time ago that the way to go with this as a business owner, would be to take the issue of Australian carbon credits and then close the business down or move overseas. The credits are guarateed right? They will always be worth at minimum $15/tonne right? This has “economic disaster” written all over it. The Aussie taxpayer is in a deep hole and the Labor and Green parties are still digging furiously. The European Union, which runs the world’s biggest carbon trading market, has other things on its collective mind. One side effect of all this is a 47 percent drop this year through Dec. 12 in the value of C0₂ allowances issued under the EU’s Emissions Trading Scheme. The permits, which mostly go to utilities and other industrial companies, can be banked or traded. Fages’s employer, Société Générale, announced on Nov. 25 that it had agreed to sell its 50 percent stake in carbon trading joint venture Orbeo to partner Solvay Group (SVYZY), a chemical maker. In Europe, demand for emissions permits has been crimped by the economic slowdown, which has forced industry to idle plants. The value of carbon trading fell 8 percent, to €23.7 billion ($32 billion), in the third quarter from the previous three months as the price of permits tumbled, according to Bloomberg New Energy Finance data. Some of Europe’s biggest energy and manufacturing firms say the EU must act to raise the price of carbon and ensure that CO2 emissions targets are met. A letter to the European Commission from the industry group warns that the future of the EU’s Emissions Trading Scheme (ETS) is at stake. The EUCLG Director, Sandrine Dixson-Decleve, told BBC News that “the ETS is no longer functioning as it should be functioning”. The EUCLG wants the EU’s Energy Efficiency Directive to be aligned with the ETS, because it expects a 13.9% reduction in carbon prices if firms in the ETS increase their energy efficiency. The letter says the EU must take account of the potential impact of the directive and other green energy policies on the carbon price, to ensure that the ETS remains viable. In the fourth phase, regulators EU should introduce a mechanism that would protect the ETS from future macroeconomic shocks, according to the letter. “This could be delivered through a number of mechanisms including consideration of an auction reserve price,” the companies said. where are our journos asking the Govt and Opposition about the EU’s unilateral aviation carbon tax, or the collapse of carbon trading? ***Curbing carbon emissions by charging for them isn’t necessarily a bad idea says Chris Goater, a spokesman for the International Air Trade Group Association, as long as the process is controlled by an international organization, not one region. Either way, the effort to deliver greener skies could get ugly come New Year’s Day. The ultimate arbitrer of the airline tax war will be China, with a massive program of purchasing planes in the pipeline. Just one cancelled order from China would have massive flow-on effects for Airbus and the myriad of businesses that feed off it. This will either go to Airbus, or it will go to Boeing. Expect a quiet withdrawal / postponement from Europe on this one. Fighting the rest of the world isn’t a great way of working. Blogging this from my cellphone. Reports coming in from my sources say it was suspended tonight more later..
It’s all over as Greenwash enters the lexicon. SA Water chief executive John Ringham said it had abandoned the commitment to make the desalination plant carbon-neutral because there was “no clear, agreed definition of what carbon neutrality was”. If one acquired emails via hacking, that prove a fraud/crime is in process, then how can that be seen as a crime too. Isn’t it one’s public duty to reveal a crime that one feels is about being committed? What future is it buying a worthless permit? Hoping to eventually make money from it? From where I stand, if a permit is such a low price, even so without an infrastructure that controls how much one is allowed to emit without penalty, seems somewhat a bodgy scheme. comment by MJW: The Police and Criminal Evidence Act 1984? What more can I say? As sad as it is for those on the wrong end of the stick, it was also on the cards from the day the scheme was born. a particularly hard story to prove false. People only have to go to the history books to see that throughout the ages, things like this have been happening. On the Mississippi/Missouri River there have been monster floods that literally dwarf anything from current times, the only difference now being that there are infinitely more people and huge built up areas that leads to much more damage being caused by smaller floods than these monsters from the turn of last Century and later. If extreme weather events cause these floods now, and that is supposedly induced by Climate Change/Global Warming, then what would these monster floods be attributed to? There’s the 1903 Missouri Flood, and the even larger flood on the Mississippi in 1927, the most destructive flood in the history of the U.S. dwarfing even the floods of 1993 and 2010. Incidentally, that monster flood of 1927 led to a pretty famous song. Kansas Joe McCoy and his wife Memphis Minnie wrote the song and recorded it in 1929 in reference to this 1927 flood. The song was later reworked and made into a pretty big hit by an ‘obscure’ (nyuk nyuk nyuk) English band called led Zeppelin and they included it on that wonderful album affectionately titled Zoso, their fourth album. This is the original and includes some images also of that flood. Sorry to go OT with a music clip, but I thought some of you may be interested. Forty years ago, On the 8th November, 2011, British rock juggernaut Led Zeppelin released their magnum opus, “Led Zeppelin IV. * The song that inspired THAT guitar riff. * Stairway to Heaven played backwards for satanic messages. * The words to Gilligan’s Island sung to Stairway to Heaven. Lukashevich also said that Canada would remain a Kyoto protocol country for another year, until all its obligations under the Kyoto protocol expire. The country, which signed the treaty in 1997, failed to meet the target of decreasing carbon dioxide emissions by 6 percent in the 2008-2012 period, which has instead grown by 17-30 percent. Just you watch… even when the carbon price collapses, the EU will step in and resurrect the ETS yet again, at enormous cost to European taxpayers. Whatever happens, the EU will not allow the ETS to collapse because it knows a collapse will spell the death of carbon trading forever. The green dream will die… green companies will die… environmental activism will die… and too many heads will end up on the chopping block because of the obscene amounts of taxpayers’ money wasted on this great big global warming con. Tyndall likes to attempt to “set the agenda” on various global warming discussions and it certainly appears they succeeded when it comes to the UNFCCC and Kyoto2. This document reads pretty much like a first draft of COP17. Is this for 2012 – 2013 only? What will it be for 2013 – 2014 etc? as emissions have to reduce! With the additional costs of the ETS etc the extra revenue for profit, it would be close to $1 Billion increase for MaGen to survive? This is only one power station! This could result in an extra $42 per head (PA) every man, woman and child in Australia alone – tell me this is not real. And yet Gillard tells me this is only going to cost me $10.00 per week extra of which I’ll get $10.20 back in tax relief! I’m sweet – but who pays????? Then what happens in 2013, 2014, 2015, 2020, 2050???? As I have said all along, this is complex, and that is what the Government is relying on, the fact that very few people have an understanding of the structure of what is happening here. Of that, the emissions just from the generation of electrical power come to 40% of that total, or just a tick under, and this is the area I will use to explain the structure. The Government calls them the big emitters, or in those now infamous words, ‘the derdy polluders’. Of those 500 on the list, this includes every electrical power plant in Australia, and CO2 emitting plants make up 93% of all power being generated. These power plants are NOT the ones paying for this CO2 Tax. They are just the middlemen. What they are being charged by the Government, they then pass all of that in full down to all electricity consumers. Now, here’s where the ‘weasel’ part of it comes into play. The Government takes it down to the individual person level. However, electricity is consumed in three sectors, Residential (38%), Commerce (37%) and Industrial (24%). The Government plays up that is giving individuals recompense, through increase in pensions, less personal tax, etc. and then saying that this will cover any increase in their electricity bills. Dave, you say you will be receiving an extra $10 per week. Pensioners will be getting an extra $3 per week. Notice how they say this will cover your increase in the electricity bill. I still contend that electricity costs will rise by around 25 to 30% because of the imposition of this Tax. Note specifically how the government plays up ‘individual person’ or, if you will, the residential portion of the electricity impost, that 38% Residential section of the 40% overall emissions if you will. The recompense is for your home electricity account. Commerce and Industry get no recompense, and just one store in one shopping Mall has a vastly more expensive electricity account that your home account would ever be. They, along with Industry as well, will have to pay around that 30% increase to their electricity bill also. They too will have to pass those costs on as well, they have to, overheads being as tight as they are. That’s problematic too because the Government has threatened to have their Carbon Force checking them out. So, back to the residential sector that is being compensated. Now, those increases are paid at the singular level, say if you and your husband/wife work, then you both get that slight increase, and the same applies for pensioners, a fortnightly increase of around $7, say one cup of coffee at a cafe per week. Will you, or the pensioners be putting aside that small pittance towards your 90 day electricity bill. Also, is the bill sent to your house, one for you and one for your partner, or do you just get the one 90 day bill to your residence. No, the low ball compensation will not cover any increase. You send the money to your provider, who then send it along to the power plant operator, who then forward it to the Government. You pay, and the Government receives. The power plant is only the middle man, collecting, and then on forwarding the money they have to pay to purchase their Government regulated Credits. The compensation is for 38% OF 40% overall emissions, plus a little extra the Government magnanimously chucks in, but that’s only for some, as those earning above a certain amount get no compensation at all. They just have to foot the extra 30% rise in their electrical power bill, as does all of Commerce, and all of Industry. They then have the hide to suggest that people may in fact be getting ‘free’ money, because they can make initiatives in their home to save on their electrical power consumption. Any savings you make will be so minute as to not even register. To make any savings, you would need to turn off your hot water, turn off the air or heating, wash clothes only once a week, don’t cook as often, turn the fridge off one day out of three, and so on. You pick the choice you want here. These people in Government who have foisted this great big con on the Australian people are relying on the fact that no one has a clue, and the clueless media just sycophantically parrot what they are told by the Government, and the ‘true believers’ out there just lap it all up, knowingly nod their heads and say that this is a win win, both for people, and also for the environment. The only winner in all this is the sneaky Government who won’t tell the real truth of the matter. It’s a pity that say, just one big generator will say nup, not us, we’re just shutting down. See what happens then. They might be getting worried but why the hell should we bail them out? Aren’t they the businessmen or women hence they can see canny investments when they need to? So much for a free market enterprise almost like the banks that need bailing out every decade or so. They need to sit back and understand they can’t expect people to bail them out when they were told categorically it was all based on junk science and a bad investment to start with. This is such nonsense !! Translation : pesky Mr Market playing games with us. The market manipulation will continue until we get the price we want. Is it any wonder why the market price keeps collapsing. Who on earth would want to spend any money in a rigged market where they will just keep fiddling with supply/demand to try and get the ‘right’ price? Can you imagine trying to open a bakery where the government kept intervening on the price of bread? Where, if the price of bread got too low, the government closes down random bakeries to restrict supply and ‘restructures’ the market? Who would be crazy enough to put money, time and energy into a market like that? Why are we even having these conversations about central planned economies in the 21st century? How many lives have to be ruined before this charade is called out for what it is? It’s Sunday now, the price must be at least $1.50!! And Greg Combet wants us to start at $23/tonne. The man is a lunatic!!! A free market is one in which one presents one’s goods for sale at a competitive price. If I wish to purchase a product because I need it and it’s within my desired price range I then shop around to find a product which suits my needs from a number of vendors. Those vendors COMPETE for my business. Then I make the purchase and put the product to use with appropriate warranty backup. I DO NOT wish to pay a CARBON (sic) TAX, do not need it and cannot use whatever I’m paying for. Therefore its not a FREE market but a FORCED market. I lose my free choice and am forced to pay for a product (sic) based upon a fraud …. $6.30 Euros for a carbon still sounds exhorbitantly high. With most things in this world (including us) being carbon based, something in the nano zimdollars range would be more suitable -provided they had accurate measures and stored their carbon for trading as a physical entity, of course – not these estimates based on unreleased treasury models, for example. I wonder if the traders get a fixed amount for each trade -i.e. $1 per transaction or something along those lines? Trading in theoretical trace gasses by the people who bought us teh GFC – it’s a dream come true for those thieving pirates. Could this idea have relevance to this debate? I particularly liked the quote attributed to Paul Caica in the article from Adelaide Now. “The State Government is exploring opportunities to offset the emissions of Cabinet ministers from 2010/11 but we are confident this will be achieved,” he said. 1. Why is the State Government emitting Cabinet ministers? 2. How are these emissions to be offset? Seriously though, it’s a pity that the word, emissions, is now automatically associated with CO2. i) Potential libel claims against Laden and Mann and any others who might be found to have stated, suggested or implied that there was criminality on the part of Tallbloke. ii) Potential malfeasance by the persons responsible for the obtaining of the Warrant in the form deemed appropriate (but actually wholly inappropriate) and for the heavy handed treatment of Tallbloke who would always have been prepared to assist voluntarily. iii) Various damages claims under UK law for distress, inconvenience, invasion of privacy and damage to property. iv) Possible injunctive relief preventing examination, copying, cloning or any unauthorised use of Tallbloke’s private data. v) Requests for immediate return of Tallbloke’s property and rectification of damage done during the process. vi) Investigations into the sequence of events that led to this farrago and the identities of the person or persons responsible. Other possibilities may come to mind in due course. Is there any legal way to have an intermediate clearinghouse for financial support for Tallman? I may be willing to commit funds on his (and his family) behalf but for many reasons need anonymity. Given what he has endured the reasons should be obvious. At some point we may all need to reveal our true identities but I’ll reserve that moment for a time of my choosing. That said, I feel compelled to render assistance to Tallbloke/Tallman.